In an effort to eat more healthily, I’ve been eating and buying more salads more and more lately. Because I believe that food preparation should be as easy as possible, I only buy prepared salads by brands like Dole or President’s Choice. More accurately, I should say that I buy washed greens, because that’s all it really is. I’m also a bargainista, when it comes to clothes, household cleaners and also groceries, at least where I can be. I’m lucky to have a Loblaws closed to my house, so that is often where I find myself getting my grocery. And this Loblaws isn’t like any plain old Loblaws – it’s huge (85K square feet, to be exact), with an enormous selection of grocery and prepared food. I honestly love that place. It’s been open for a year and a half, and I still get excited to go there. It’s kind of lame to be excited to go to a chain grocery store, I know, but I always have a great shopping experience every single time I go. Alright, alright, I’m digressing a bit. The point of this post is to showcase how to make smart choices when buying salad from Loblaws. You’ll see a picture of pre-washed greens and prepared salad. 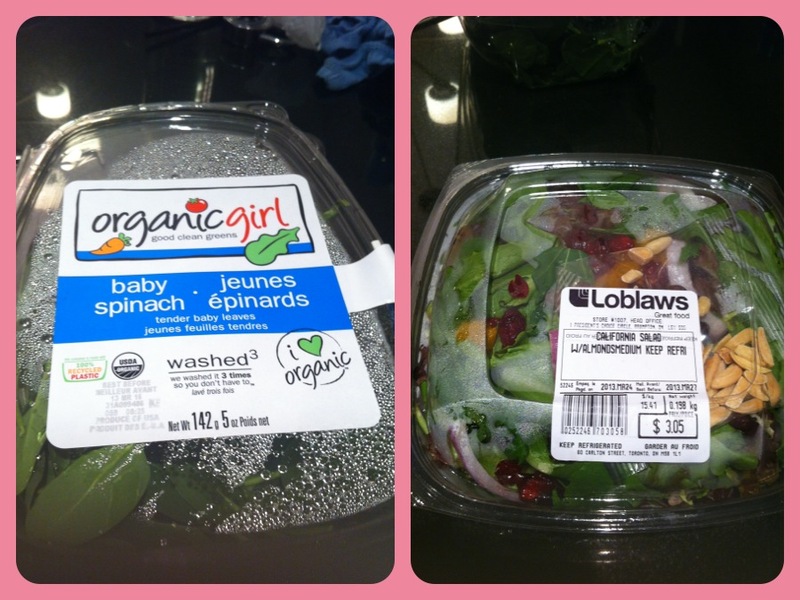 **Full disclosure: the Organic Girl salad was not actually purchased from Loblaws, but is equivalent to the type and cost of salad sold there. 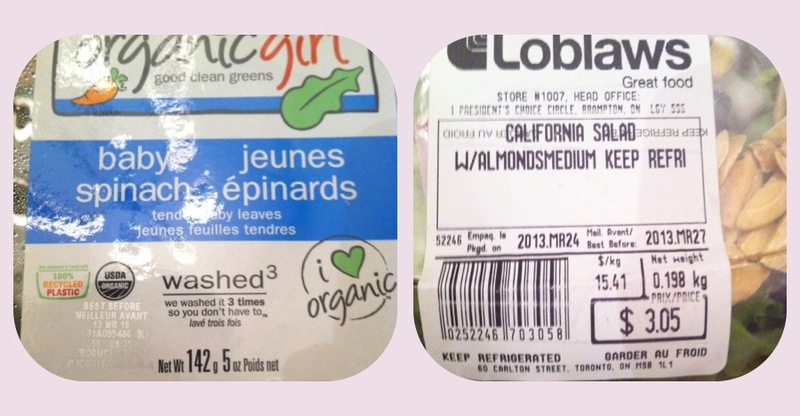 The other half of the picture shows one of Loblaws’ pre-made “California” salads, with mixed greens, dried cranberry, mandarins, red onions and almonds. The spinach salad is 142 grams at a cost of $4, while the prepared salad, with greens and other fruits and vegetables, is 198 grams, at a price of $3.05. To me, the clear winner is the prepared salad. And Loblaws carries a plethora of prepared salad. Mind you, the unit cost of the salads with meats and cheese tend to be higher, but on an apples-to-apples … or should I say lettuce-to-lettuce comparison, the prepared salads tend to be a better deal. Of course, not everyone reading this will shop at Loblaws or have one near them, but it’s some food for thought when grocery shopping, whatever store you shop at.